The Albatros, first flown on November 4, 1968, is the L-29's successor as the standard trainer of all Warsaw Pact countries except Poland, and was in production in a light attack version, mainly for export. 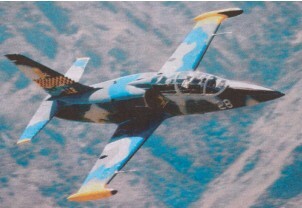 Designed three years after the L-29, the L-39 went through a series of prototype and development models before seeing production begin in 1972. The L-39 was designed with simplified and a more modular approach to engineering allowing the L-39 to be produced more efficiently and quicker than the L-28. The base powerplant allowed for a thrust upgrade when compared to the L-29 and avionics coupled with reinforced subsystems put the L-39 ahead. A tandem-seater, with the instructor in the raised rear ejection seat, it is powered by the 1720-kg (3792 -lb) thrust Walter Titan, the Czech-built Ivchenko Al-25TL turbofan also used in the Yak-40 STOL trijet. The name Albatros is used only for L-39 aircraft in service with the Czech air force, to which deliveries began in April 1974. The basic aircraft is equipped with a cam-era gun and electrically controlled gunsight, but has no internal gun. Gun pods, bombs, rockets and missiles can be carried on two or four wing pylons along with a centerline-mounted 23mm GSh-23L twin-barrel cannon for close quarters work. With production of 2,600 by 1990 it proved to be a very successful aircraft, with more than 2,900 built by 2005 with about 300 in civilian ownership around the world. The aircraft is fully aerobatic stressed for +8G and -4G and can climb at the rate of about 3500 feet per minute. Export numbers for the L-39 Albatross were roughly the same as the L-29. Thailand went on to purchase an export model designated with L-39 ZA/ART that featured Israeli-produced Elbit avionics. The most numerous in terms of production was the L-39 "C" model, which helped drive total production total past 3,000. Earlier variants of the aircraft are the L.39ZO weapons trainer, the L.39ZA ground attack and reconnaissance aircraft, which has an under-fuselage gun pod and four wing hardpoints, and the L.39V target tug. The L.39MS version of the Alba-tros was rolled out in mid-1986, but later designated the L-59. Engine: 1 x Walter Titan, 1720-kg / 3792 -lb thrust. Engine: 3,800 lbs thrust turbofan. Engine: 1 x Ivchenko AI-25TL, 16.9 kN. Initial ROC: 1260 m / min. Armament: 1 x 23 mm. Engine: 1 x Ivchenko AI-25TL turbofan engine generating 3,792lbs of thrust.